I’ve always been fascinated by other people’s street art (as anyone who walks past a piece of street art with me and has had to wait while I faff with the camera will attest to). Since I took up the sneaky stitching mantle (in my handmade manner) I’ve been studying the masters like a good student should. After all every Skywalker needs their Yoda. Sneaky street art has some heroes who are worth watching. I had already dipped my toe into street art tributes in Augsburg with my fibre-based flowers. This lead to me having my bubble burst when I was told my flowers were a copy cat of copy cat. Despite (or perhaps because of) the line of crafty copy cats all in a row I decided I quite liked the idea of a woolly wave to my street art heroes. Then Tate Britain invited me to graffiti knit at their Tate Late event. What better way to honour my street art heroes than to shove them stitchwise into one of London’s most well-respected art museums? And so my Stitched Street Art Salute was cast on. 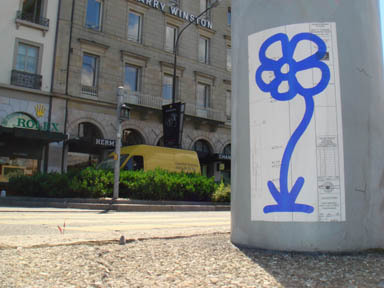 Michael de Feo is most famous for his simple street art flower. The flower has popped up all over the planet, from HUGE blooms to tiny sprouts, from his street art beginnings in New York City to Hong Kong, Buenos Aires and even my lovely London. It was actually Mr de Feo’s flower I inadvertantly turned woolly in Augsburg. My fibre-based de Feo flower. Bloomin' knitted it is. Invader is the street artist who first inspired me to take my stitching to the streets and make it sneaky. I have been stalking the Paris-based Space Invader Mosaics in Central London since I moved back here in 2000. They are everywhere. My prouded Invader find was spying one in Kathmandu after returning from my trek in the Himalayas. It was like finding a little piece of home. We come in purls. Take us to your leader. Stik has been herding his stick people around London for more than a decade. 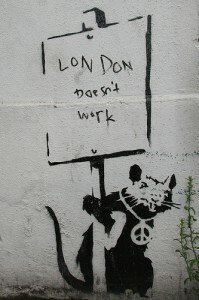 Starting in Hackney Wick he “marched westward to Shoreditch and the rest of London” (according to Street Art London). Each simple figure manages to have more life in it than some people I observe on the tube while travelling around London. 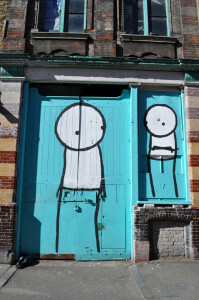 Stik has created his street art through hard times too, which makes it even more fascinating. I’m obsessed with it, but it takes a certain amount of obsession to get anywhere in this world, I think. If you’re half-hearted, people overlook you. I’m not sure that Banksy needs an introduction. Think what you will of him the man has some painfully clever ideas and the guts to go with them. I recently read his Wall and Piece book and was amused to discover he graffited a piece high above Piccadilly Circus before we did. Dammit! Imagine a city where graffiti wasn’t illegal, a city where everybody could draw whatever they liked. Where every street was awash with a million colours and little phrases. Where standing at a bus stop was never boring. A city that felt like a party where everyone was invited, not just the estate agents and barons of big business. Imagine a city like that and stop leaning against the wall – it’s wet. 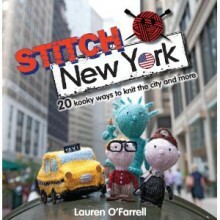 And here’s a peek at my partner in purly crime, The Fastener’s woolly work for our Unexpected Artworks exhibit too. So there you have it. My woolly work in Tate Britain. I’m as flabbergasted as you, believe me. Knit the City's Unexpected Artworks at Tate Britain. Squeeee! If you want to see the whole yarnstorm then check out Permission the Yarnstorm: Tate Britain Unexpected Artworks over at Knit the City.